A busy day for the stable with four runners on the Hillside course at Sandown on Wednesday. Mirimar, Metson, War Legend and Whosyourhousemate are engaged with Mirimar (pictured) the first to go in race three, the Benchmark 74 Handicap over 2400m with Patrick Moloney to ride from barrier three. The import last raced on July 4 when finishing fourth over 1800m at Sandown and Mike Moroney is delighted with the way he has progressed since. “He’s trained on really well and we could not be happier with him,” Moroney said. “His work has been good and he’s a happy horse. He’s a more mature horse now so we feel he’ll be suited by the step up to 2400m. “He’s drawn to get a lovely run and he looks suited in the race so he’s definitely a chance. Metson has his fifth run this preparation in race four, the Benchmark 64 Handicap over 1300m with Patrick Moloney to ride from barrier five. “Luckily he’s drawn well and he gets away with them we’ll go forward and possibly lead,” Moroney said. “We’re very happy with him and he’s struck an even field. War Legend is in race seven, the Benchmark 84 Handicap over 1700m with James Winks to ride from barrier four. 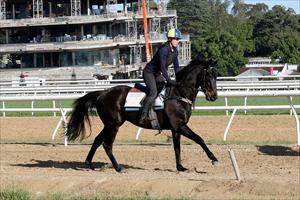 “Ideally there will be some ease in the track as that will help him a lot,” Moroney said. “If the track stays firmish we might keep him at home. Whosyourhousemate winds up the day in race eight, the Benchmark 78 Handicap over 1400m with Patrick Moloney to ride from barrier five. It is the second start in Australia and Moroney has added ear muffs to his gear. “We’ve put the ear muffs on to help him relax more - he was first-p but he did want to over race at his first start here,” Moroney said. “His fitness has improved and he looks terrific.